This is a beautiful presentation of both honey and strawberry blonde. 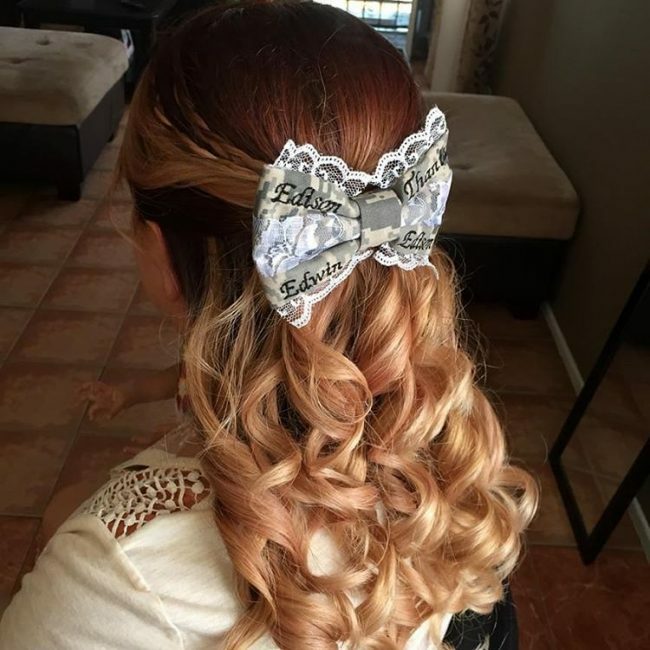 The lower portion of this hair updo terminates into loose waves which brings out the different layers of the hair cut and also makes the look even more impressive. Women with fair skin complexion to medium skin complexion and darker features are exact candidates for this color shade. This shade perfectly matches pale cool skin tones and its bright reddish layers bring out the hidden beauty in the women with a pale complexion. This shade has an amazing union of two tones of the same shade. The intermixing is beautifully done and it adds elegance to the look entirely. It also adds a different dimension to the look. Women with middle length or short length hair are fine candidates for such hairstyles. This color or rather shade is exclusively for the lightest skin tone and blue eyed women as the contrasts match well with the bright shade and light skin tone. The unique blending of light blonde and dark red stripes makes a phenomenal combination. This is a very rich two-tone shade in terms of hair coloring and it makes the appearance look rich in turn as well. In this shade one can make her appearance sunnier and lighter for the perfect summer look. The buttery strawberry texture, the softness of golden shade and the smooth finish undoubtedly makes a woman look attractive without bounds. The style unfolds hidden beauty in women with fair to medium skin tones with hazel eye coloration. In such women, this shade harmonizes amazingly. Here the dimensional effect of the strawberry blonde shade is brought out by simply teasing the lower tips randomly which has a lighter shade while the top is based on more of a bright shade of strawberry blonde. This is another soothing and tranquilizing shade and when accompanied with loose curls (end) it simply adds brilliancy to the look. Women with dark complexion or tanned skin, dark features and dark eye colors are the best and most suitable candidates for this shade of blonde. Its duo combination at a glance is sure to draw attention of the crowd. Besides, it has dimensional effect as well. 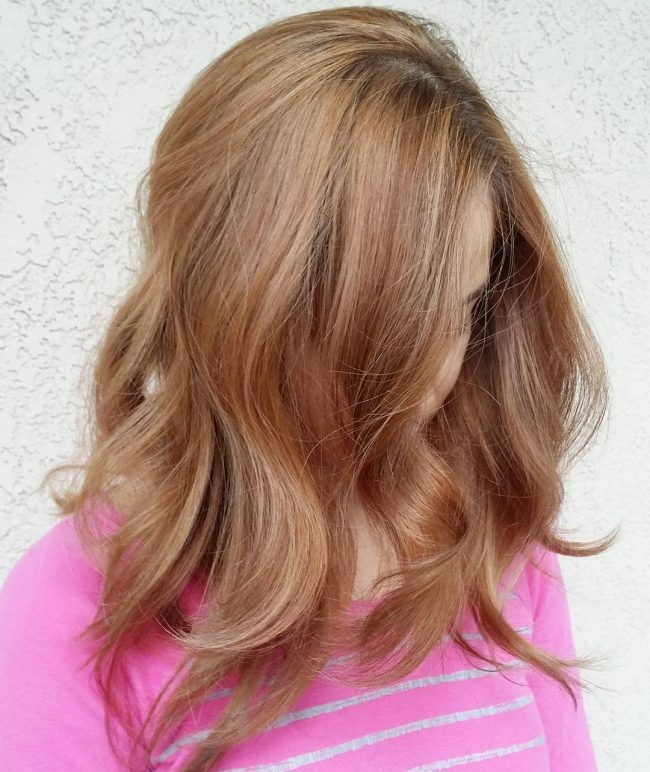 The beautiful fusion of both the dark copper blonde and creamy light strawberry is undoubtedly admirable. 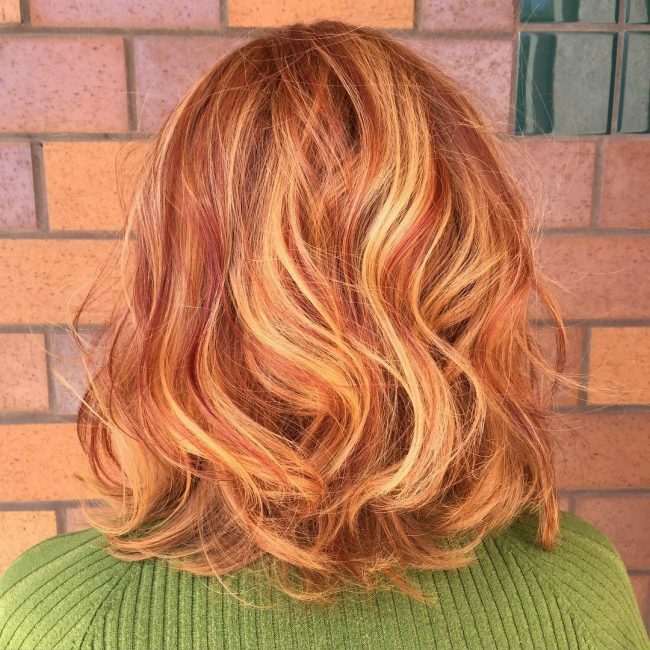 In this shade of the color, the strawberry blonde (base) gets more appealing as the creamy highlights are used throughout towards the ends to give a look of glamor. Women with this shade can simply make a braided hairstyle (messy) which will enhance its beauty. For teen girls, a bow with such updo will simply enhance its charm and dignity at the same time. This shade is loved by women who are conservative. Loose curly ends and heavy texture add a short and sweet strawberry look to a woman. Soft mixing of the two colors is commendable. For a wedding occasion or a formal event, this look is to steal hearts. It is perfect for women with slightly fair skin or medium tanned skin with dark features. It also adds class and dignity to your personality. This shade compliments women with light skin tones and even medium skin tones. For someone with darker eye coloration and darker features, nothing would suit better than this particular shade. 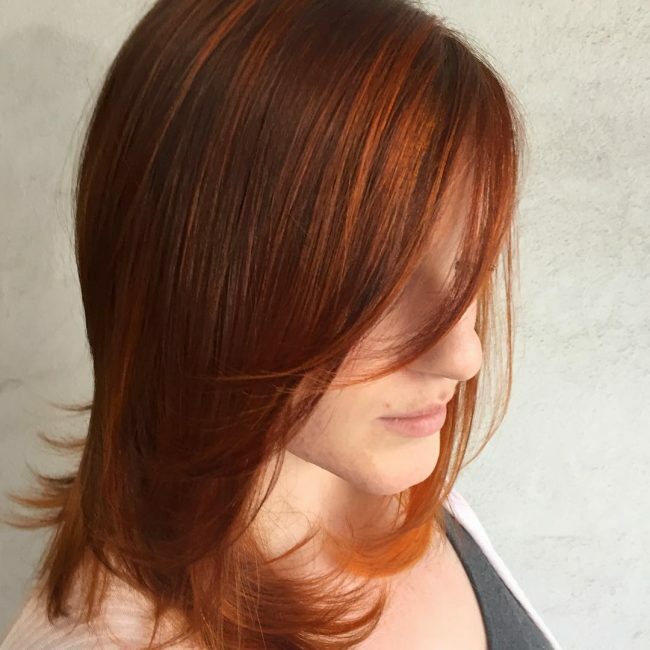 Its sudden-fiery-deep-copper highlights in a short length hair offer an extremely cool appearance. It's basically suitable for teenage people who love to be cool all the time. 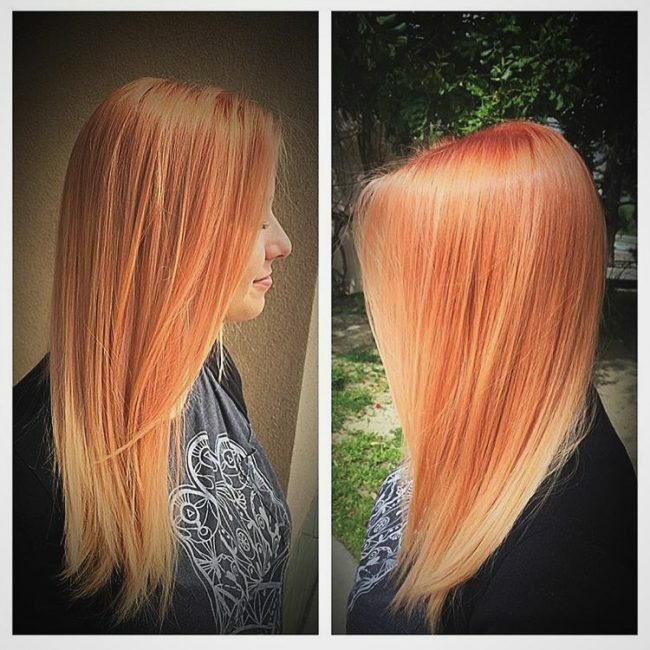 This hair shade will make them even cooler with its unique copper effect. 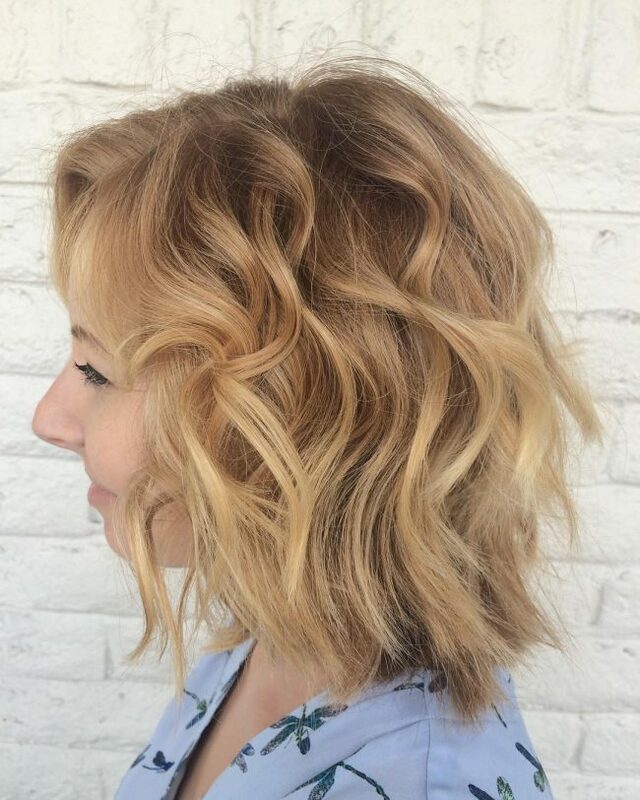 Blonde Ombre in a short straight hair is a perfect shade for a bright sunny summer. 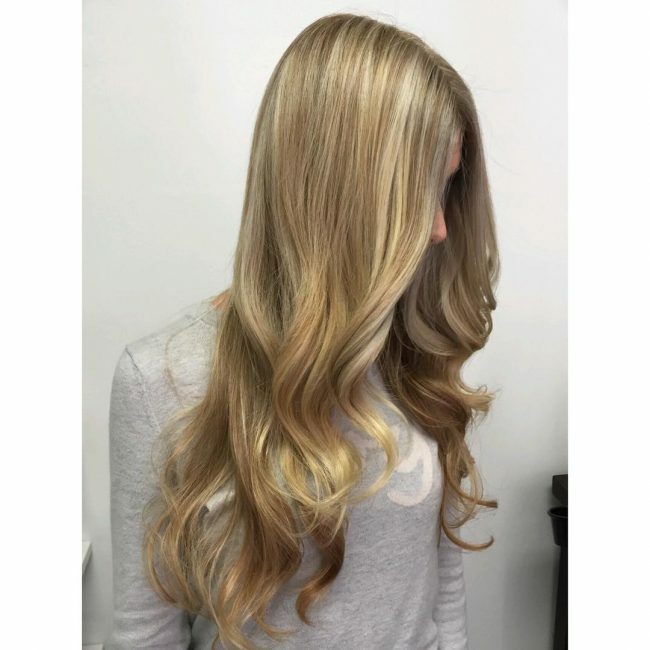 Its evenly shaded ombre mixed with light blonde not only makes the appearance cool but also trendy as ever. It looks even better in medium length hair when left casually open as shown in the picture. 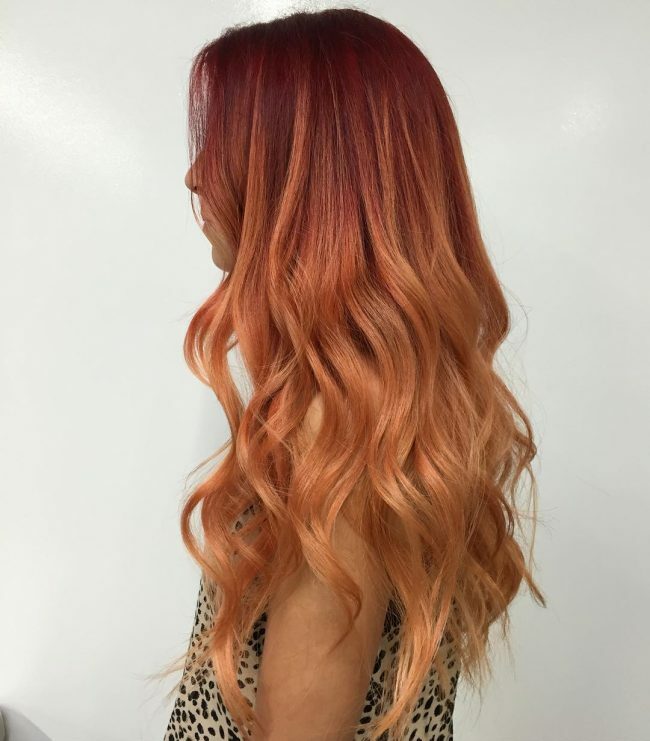 The ginger base along with that of ombre is one of the versatile shades found in Strawberry Blonde. Here platinum blonde base is used along with subtle copper ribbons. As shown in the picture this short layered and simple look with a trendy side bang makes the woman look stunning and smart. Women with light skin color and light eye colors are the ideal candidates for this shade. However, women with medium skin tones and dark eye color can also go by this new shade for a change. Here the silky smooth finish appears to be greatly charming for a woman of fair skinned and dark eye color. Its radiance is backed up by the long layers which diversify its styling more. 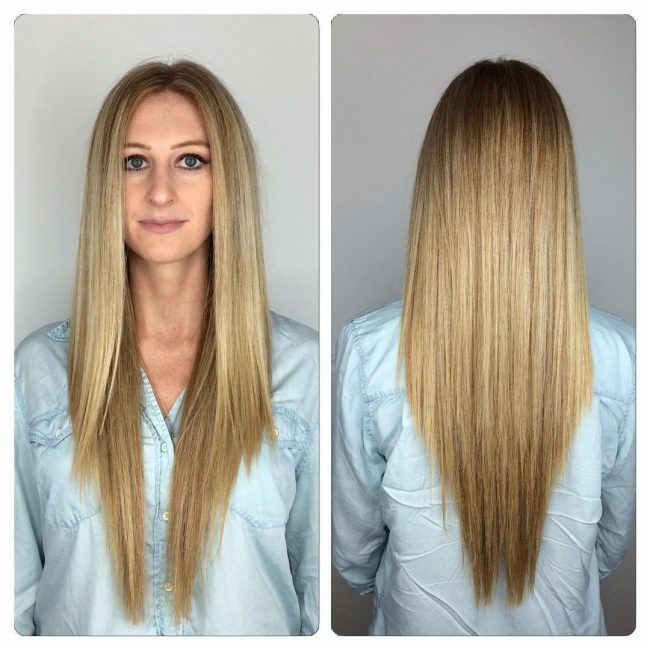 Long layered hair styles with this shade look absolutely fantastic. A teen girl with medium hair length, this updo and shade will look effortlessly gorgeous in any occasion. 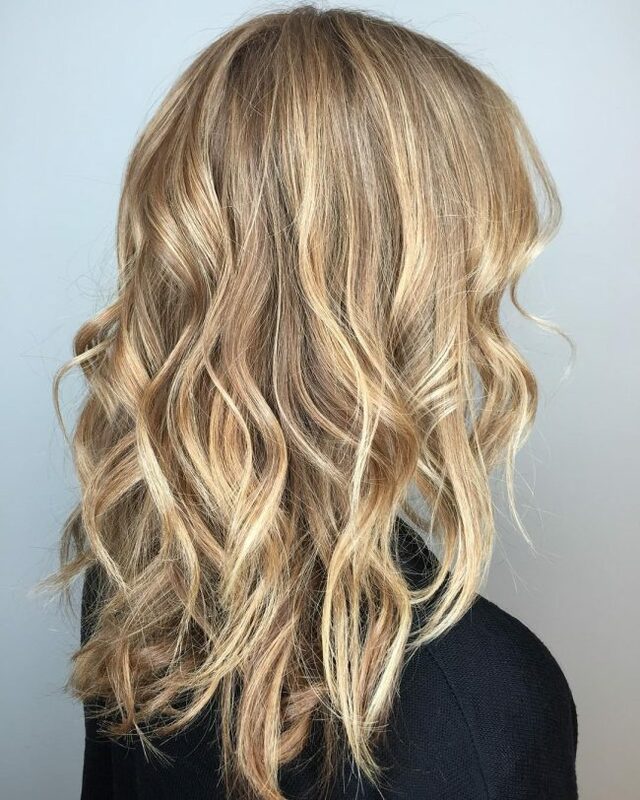 Instead of getting an ombre highlights done which vividly shows the color demarcation of both the colors, women can play with two shades of faded blonde for trying something new as shown in the picture. 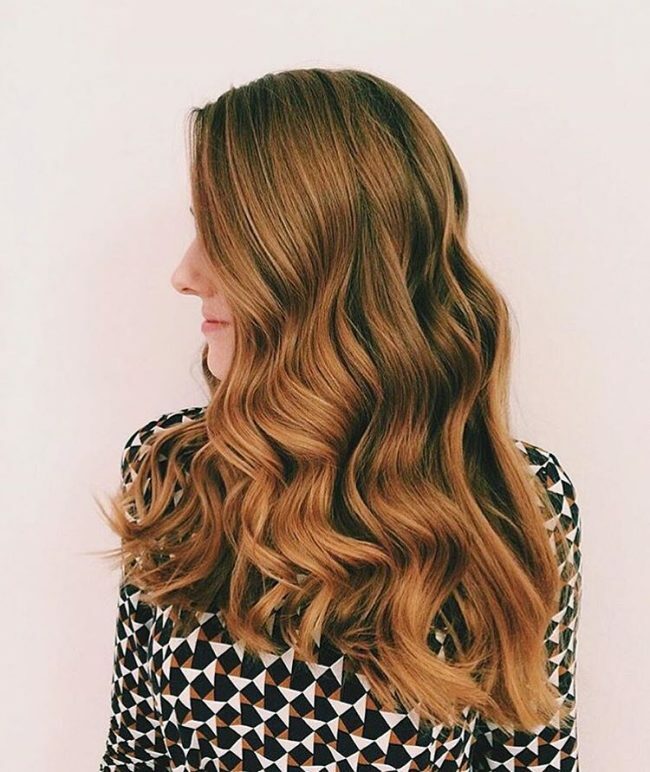 This shade in a wavy textured hair not only showcases something new and extremely suitable for both tanned and fair skinned tones but also spreads an air of softness when seen. Here the vibrant pinkish base and bright tints at the top give dimensions and also loudness to the appearance. But it's recommended not to be scared to play with this extreme shade. Its two dimensions (at the top and towards the ends) add an awesome look for the women with cool skin and light eye colors. Loose end curls and this shade are a great combination for such candidates besides as shown in the picture. The glossy fine finish of a very light strawberry shade with random end curls for any formal or informal events is the most pleasant hairstyle one can opt for blindly and with great comfort. It has a touch of a darker shade right at the top makes the look even more pretty and alluring at the same time. It is the perfect hair shade for a lovely summer or even a pleasant autumn. Its smooth texture is truly appealing. This shade is an ideal one for women with light to medium skin tones, with hair length below shoulder level and light eye color and features. Here is an interesting mix of blonde and yellow highlights. The brownish-blonde shade along with the glossy yellow streaks appear to be heavenly when exposed to sun. You can get a side bang done with this hair style as shown in the picture to make it look more heavenly. 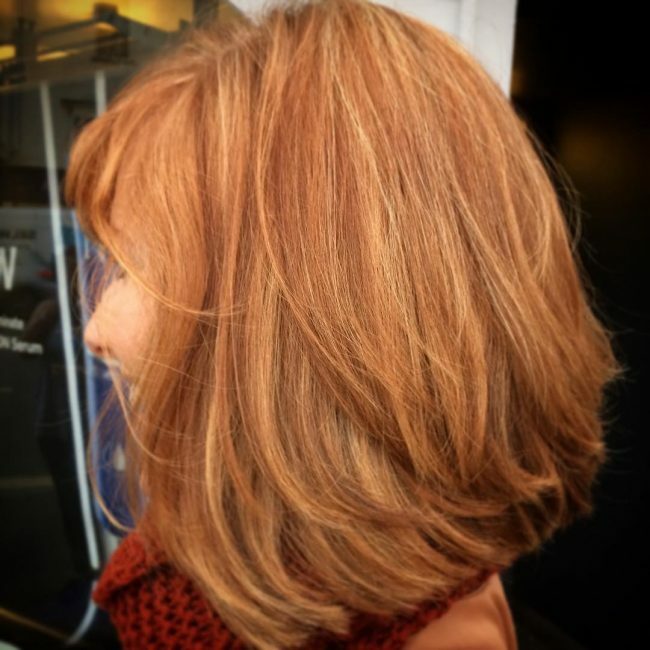 This particular and unique shade is highly coloristic and this idea offers an usual blending of strawberry blonde with golden with at different regions. In other words, the strawberry blonde at the top slightly melts into dark golden blonde in the middle and again melts to light golden blonde at the tips. This shade is needless to mention eye catching and people with fair skin tones are always free to go for this color shade. It would be better to keep your hair open or slightly curled to showcase the beauty of color mixing in this case. As seen in the picture, it is a more softer tone than pure strawberry blonde. Besides, there is a blink of blonde to blossom the color shade altogether. Women with cool skin complexion and even tanned complexion with hazel eye coloration and long perfect straight hair are classic candidates for this hair shade. 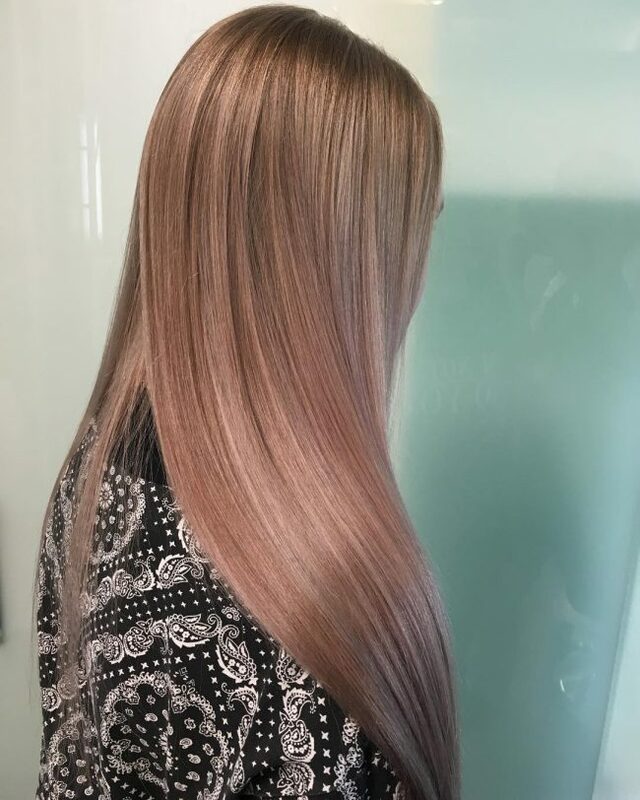 The beautiful pastel and blonde intermix flawlessly giving a completely new shade. Holland Roden in this picture looks stunningly beautiful with the great dark strawberry blonde in her long silky hair. 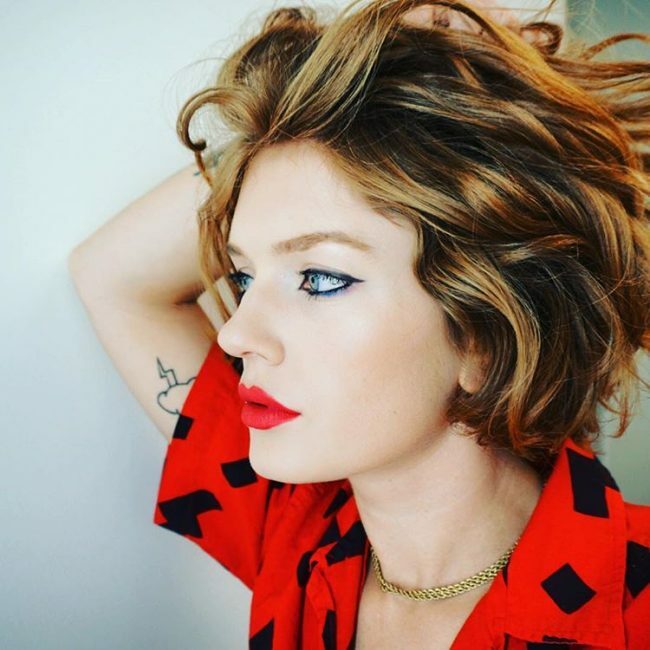 This also suggests that the typical dark strawberry blonde shade is indefectibly ideal for women with whitish skin complexion and really dark eye color and features. 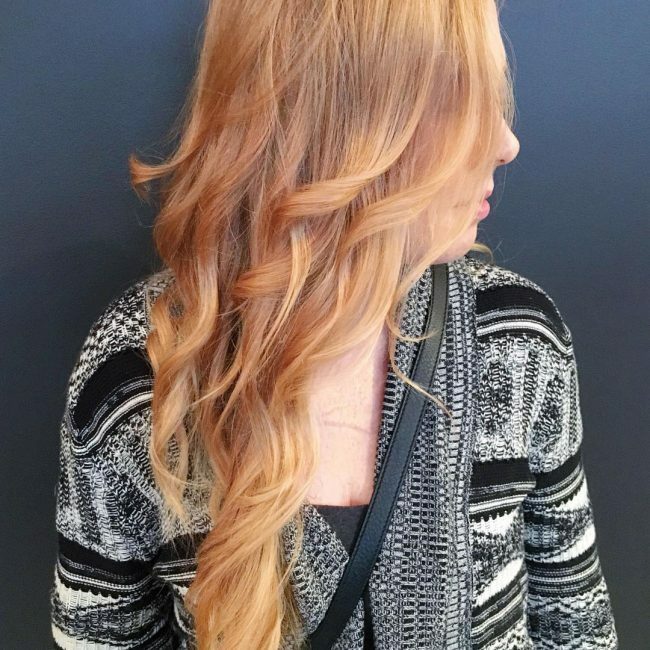 Dark strawberry blonde is one of the simplest shades of the primary strawberry blonde and is truly pleasant to eyes. It offers a grand look to those with the above mentioned criteria(s). This unlike other ombre shades, has dimensional effect because of the super long waves at the bottom which arises from the color differentiation. 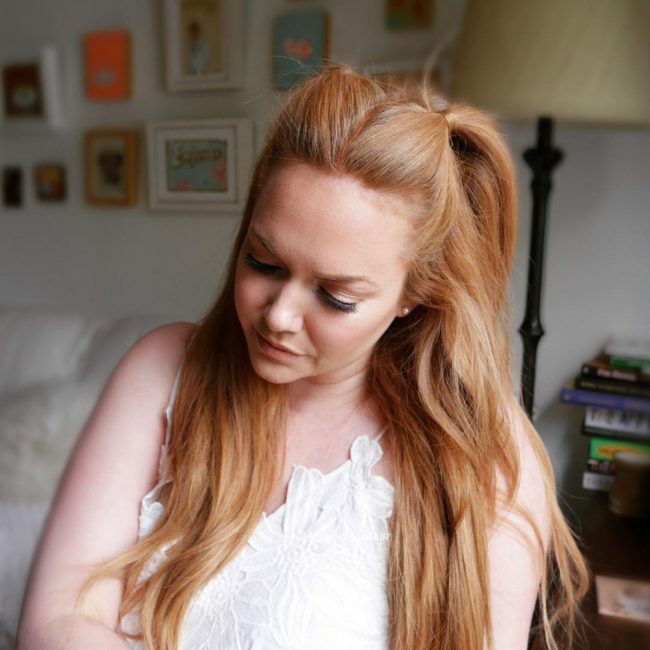 At the top there is a creamy strawberry blonde shade which has a very slim effect making it look plain sober while at the bottom there is light copper long waves which adds more intensity to the hair style entirely. 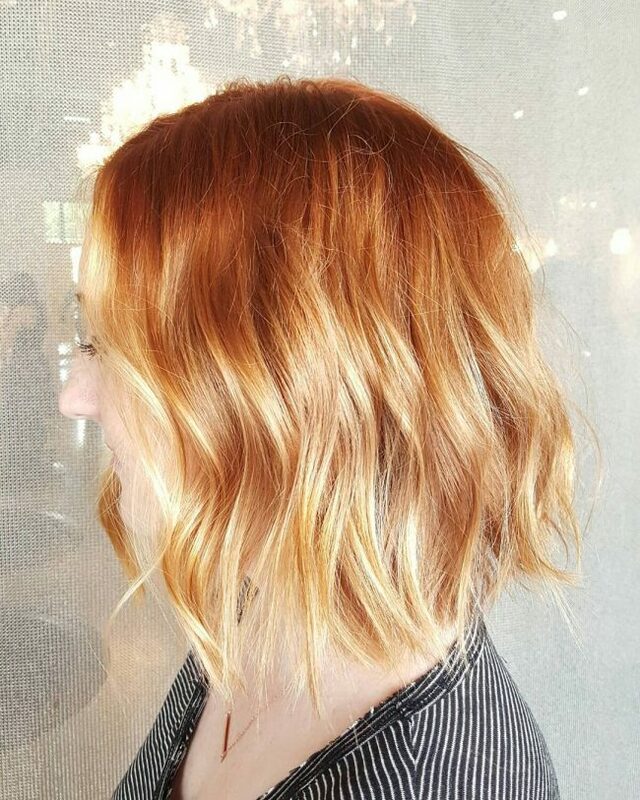 Short hair with short tresses and this extraordinary shade is a new definition of trend for a fresh bright summer. This shade has a peculiar color contractions. The actual color of light strawberry blonde is in the middle of dark strawberry blonde towards the roots and very light strawberry blonde at the tips which fades very gently. This look is especially for women with super long straight hair however the skin tone range varies from fair to dark for this shade. 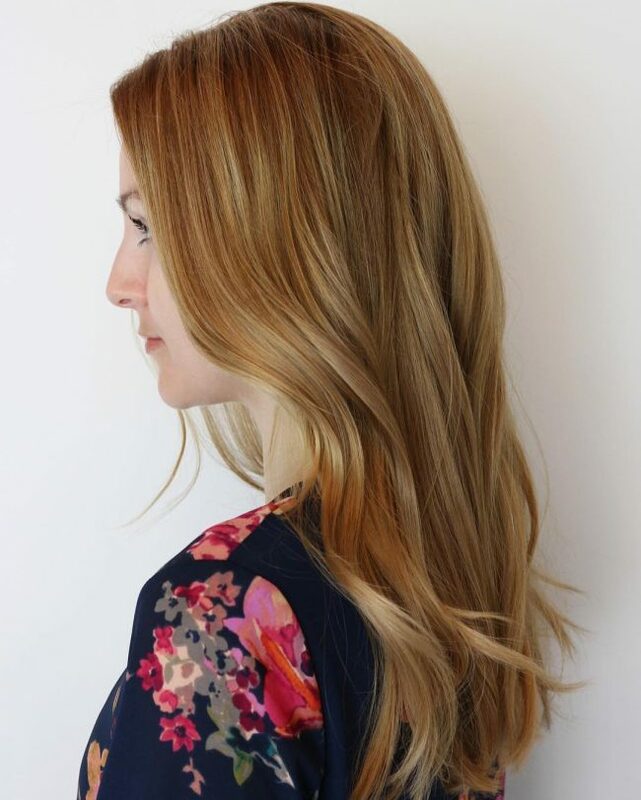 The eye soothing fusion of strawberry blonde and balayage hair color is spectacular in one word. It naturally gives you a grand and classy look for any special event in any season. 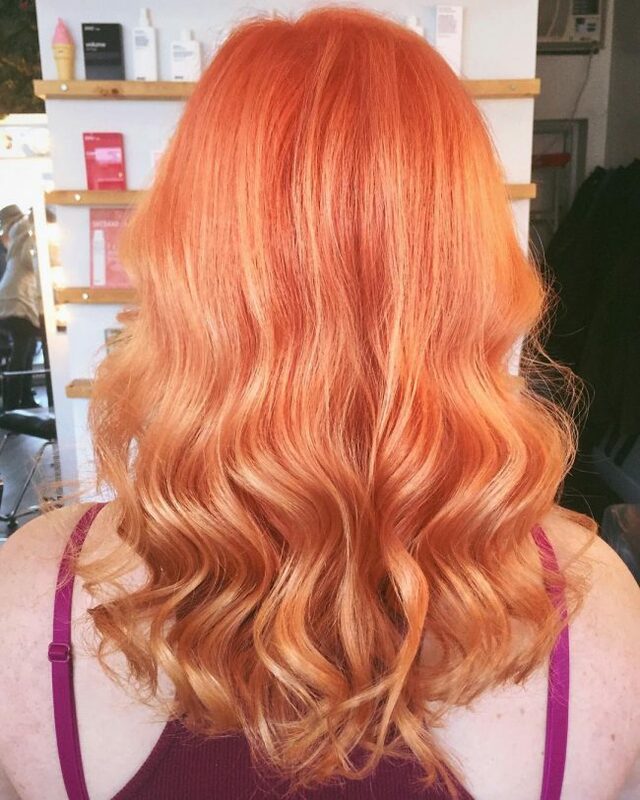 In this color shade there is an ombre-like color texture of the fire orange and strawberry blonde hues, though not exactly. What makes it different from an actual ombre texture is the perfect and smooth blend of both the shades. A short blunt cut with front bang will enrich the overall look. Women of all kinds of skin complexion are suitable for this. 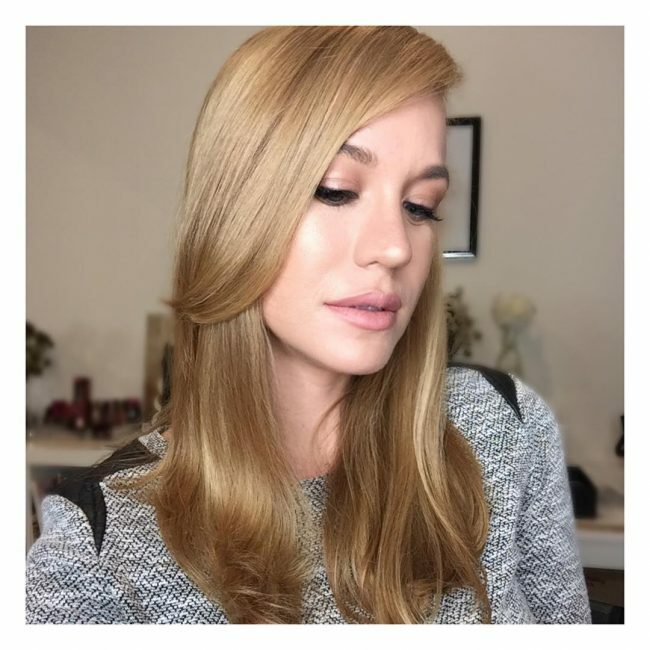 If you have light porcelain skin, dark features and long hair, play them with this amazing golden tones of strawberry blonde shade. For any grand occasion such as wedding ceremony or religious event, this shade is bound to draw attention of many out there by its simple lucid style. You can also make double hair updo as shown in the picture to bring a touch of innocence in the look. This split style is highly attractive and unique at the same time. It is one of the cool hair shades of strawberry blonde. Here the fiery red at the top fades into light strawberry blonde through the course. If you like colors and want to try out new cool shades, you are free to go and try out this amazing shade. There is an equal balance of the two extreme colors and it in turn makes the look brilliant. This color shade is wearable on every occasion. Its calming pale strawberry blonde with light brown lowlights fuse so effortlessly that one will not be able to differentiate it easily. The light brown lowlights intensify the look and women with all kinds of complexions and darker features are suitable for this. Its wavy texture at the end of the strands helps to make the look casually beautiful. 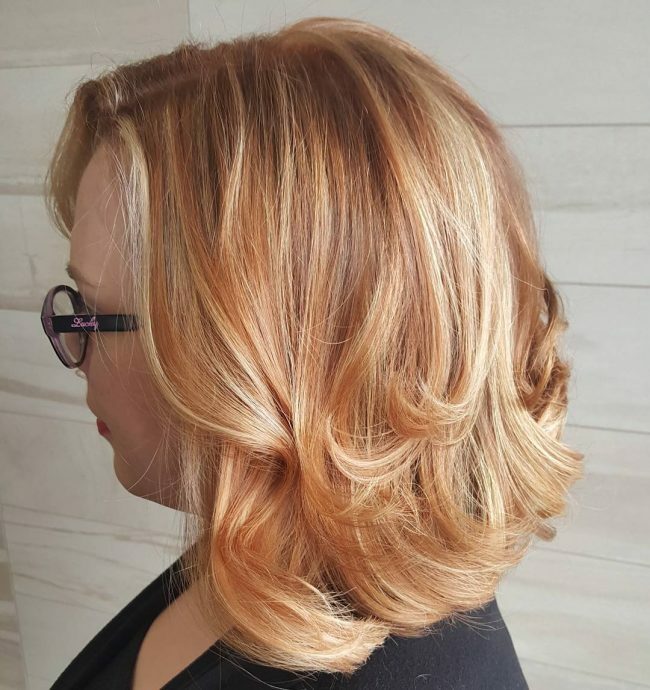 As shown in the photo, the innovative fusion of dark strawberry blonde ombre fading into light strawberry highlights gently, seems to be exotically good for women in cool complexion and light features with light eye coloration. If you want to try out new shades of dark strawberry blonde, this is the one you are looking for. This specific shade is probably the most ideal shade for a warm summer. 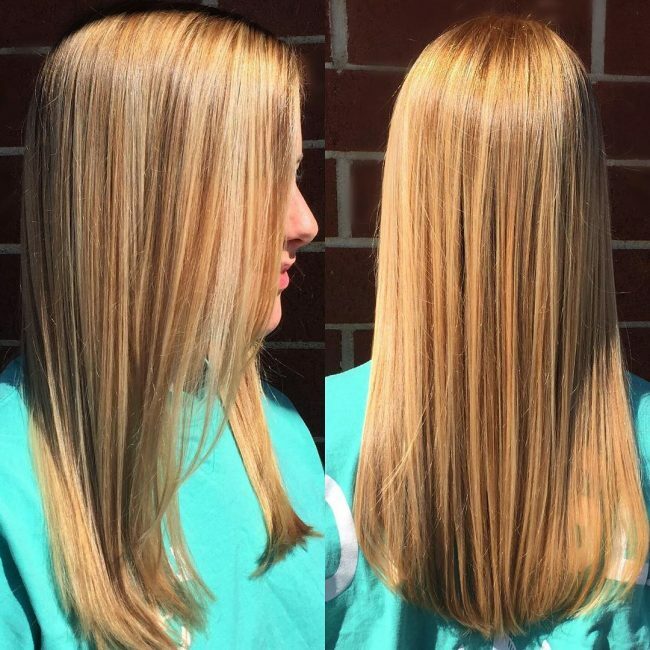 Soft honey blonde highlights always tones down your beauty and when that gets combined with the reddish undertones in a shoulder length hair accompanied by a side bang, it remarkably adds density to your hair and the look as well. This shade will be your best friend in every season because you will never stop admiring and loving it. 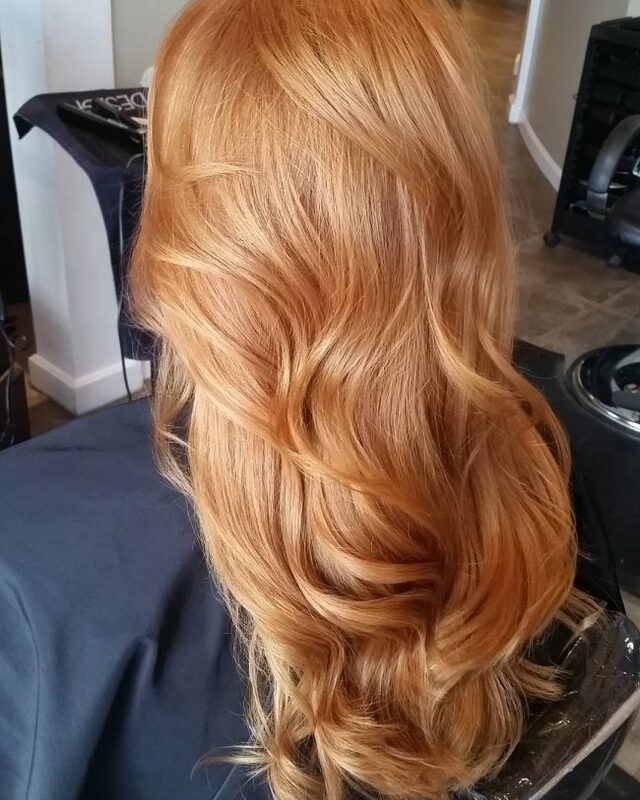 The excellent blend of the golden strawberry blonde shade with rhythmic chunky auburn highlights in a long straight hair is a magnificent look to have and watch. It is suggested for the pale white skinned women and light eye color. You can just keep your hair open and flaunt the glamour in your hair. 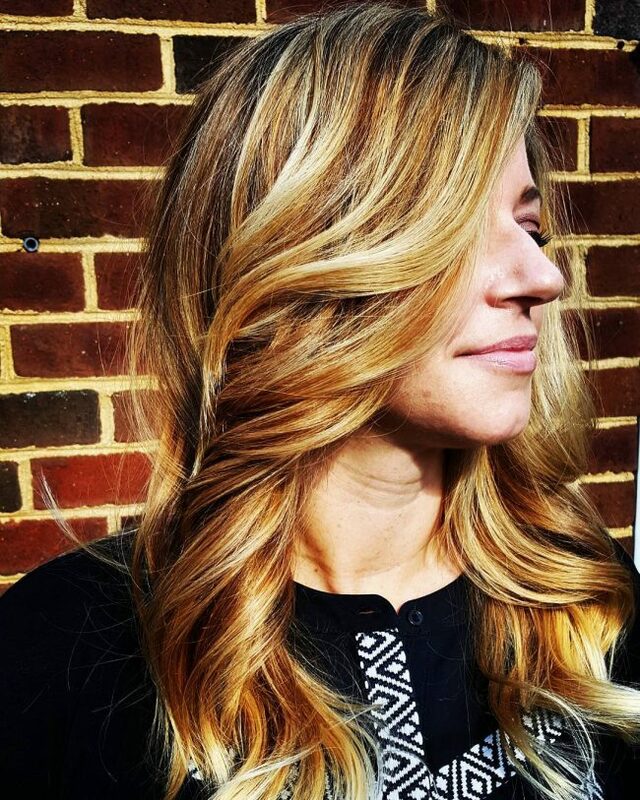 Balayage color shade is one trendy shade ever in the history of hair coloring. It reflects an alluring style in the women with medium tanned skin color with blue eyes as shown in the image. A deep V cut in this shade will appeal every eyes without fail because it brings out the graceful combination of the hair colors. 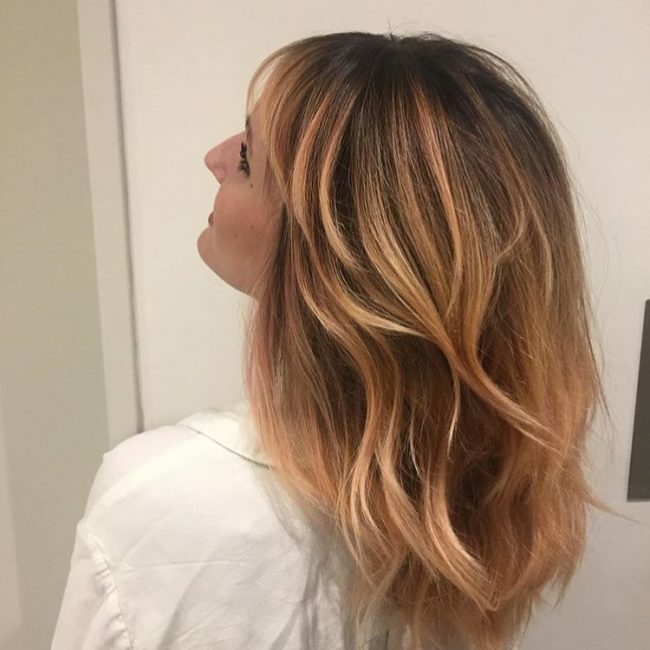 Here its dark balayage ombre at the top melts slowly into strawberry blonde highlights at the bottom and this makes a colored umbrella-like appearance towards the roots. At a glance this shade has several layers and its delicacy in mixing of the colors is absolutely creditable. Every woman of any skin tone can opt for this shade. This shade is the best one for a soft spring or a happy summer. 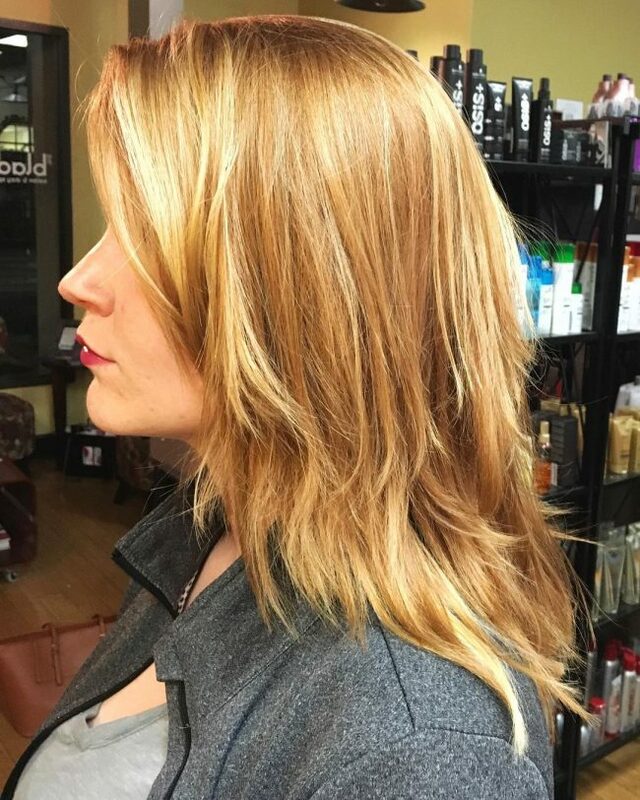 The strawberry blonde with bright golden highlights present an awesome look for woman with white skin and medium hair length. This color has only one dimension and has a slight burning effect in bright summer. Sombre is a subtle version of ombre and its effect is truly fascinating in shoulder length hair with rough tresses at the ends. Unlike the previous hair color shade, this is multidimensional and its effect is enjoyed the most in a bright summer. Tanned women appear to be marvelous when worn this shade and fair skinned women appear to be exceedingly good in this color as well. 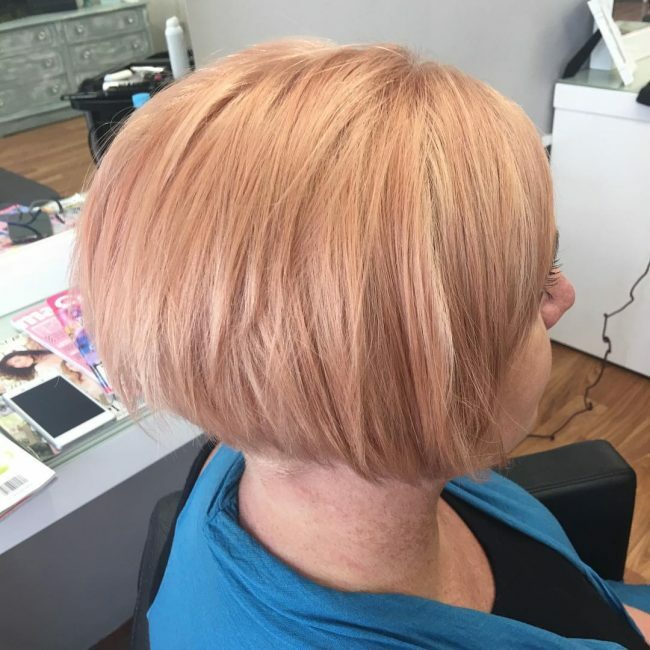 Here we have the smooth and eye-pleasing strawberry blonde shade at the base followed by champagne highlights throughout the hair course to make the appearance stupendously superb. Fair skinned people with pinkish cheeks are the finest candidates for this perfect shade. If accompanied by loose end curls as shown in the picture, it makes the view even more stunning. The hint of red in this hairdo is fantastic, and it makes a woman look trendy and also very classy. 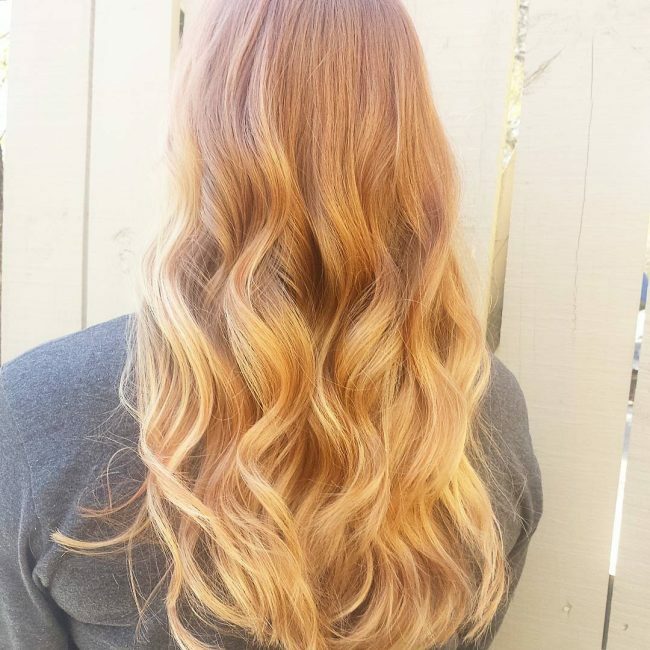 It is a strawberry blonde hair that comes from blending beige and golden blonde to create a distinctive shade. The darkened roots in the headdress and the highlights are amazing, and the fact that the strands have some subtle waves helps to enhance the appearance. The shine on this headdress is amazing, and it will brighten up your overall appearance and make your face glow. 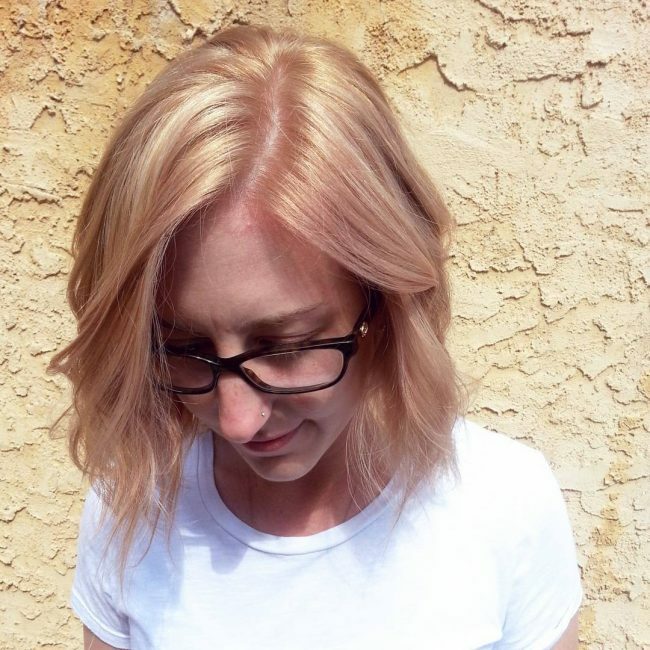 It is a strawberry blonde ombre design that involves transitioning from a dark brown base to light blonde. 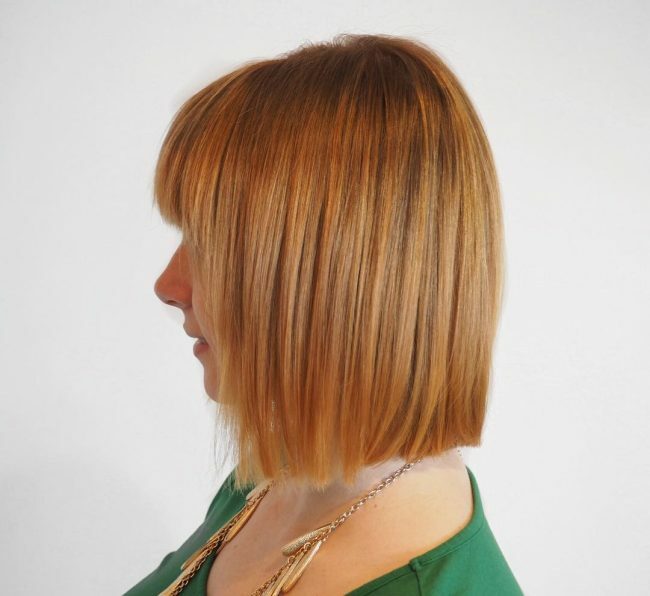 Apart from the color the long bob is also chopped to perfection and layered to give it an extra volume. Hand painting your locks will always give you a unique appearance, and it is also an easy way to get a precise tone. 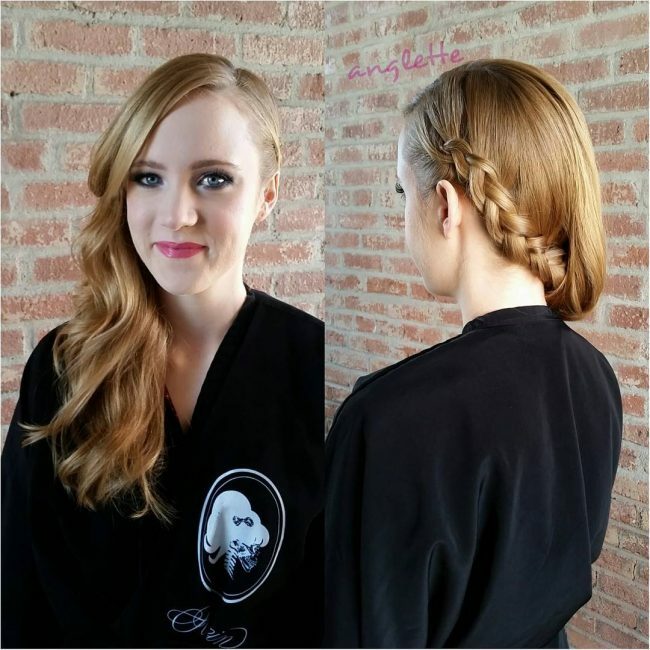 In this hairdo, the long tresses have an incredible texture, and you should style them by layering them back. However, their hand painted dye job is what sets them apart from other designs. 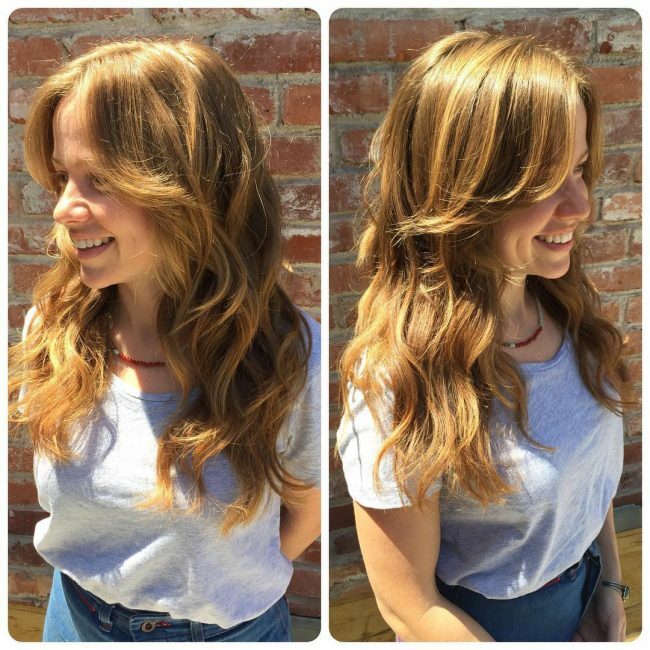 The dye job is a blend of blonde and light brown that creates a unique shade. 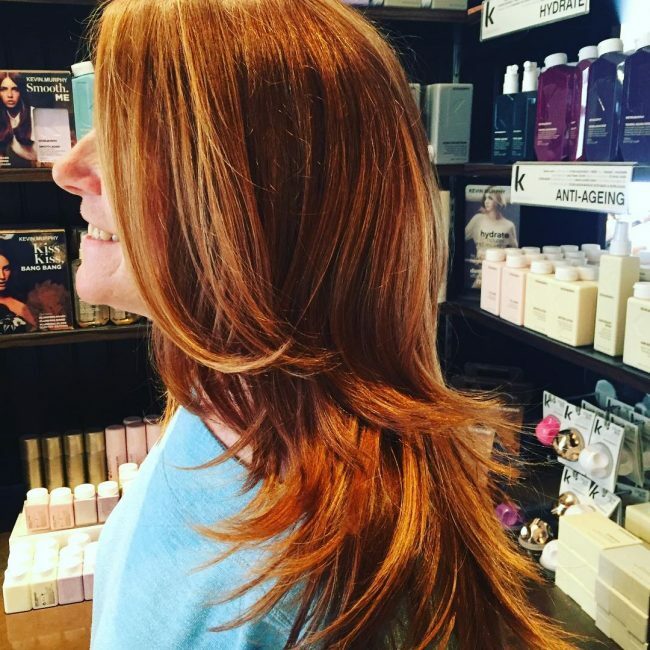 Red heads are stylish, but you can take yours a notch higher with some extra texture and by layering your locks. In this style, the long fine locks have a perfect dye job that comes from blending strawberry blonde with a shade of brown. The face frame design also helps to spice the overall appearance. The color melt in this headdress is stunning, and it will make any woman want to try out the different shades in the design. However, the style requires some inventiveness and strands with medium volume. You should finish with a part and brush the locks to the sides. 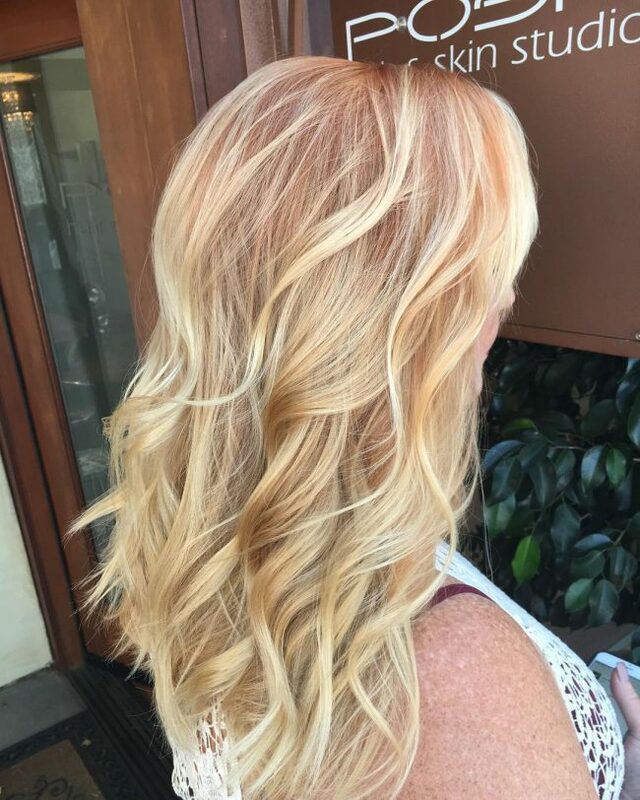 One of the things that make strawberry blonde a unique shade is the fact that you can combine it with almost any hue that you can think of and still look stylish. 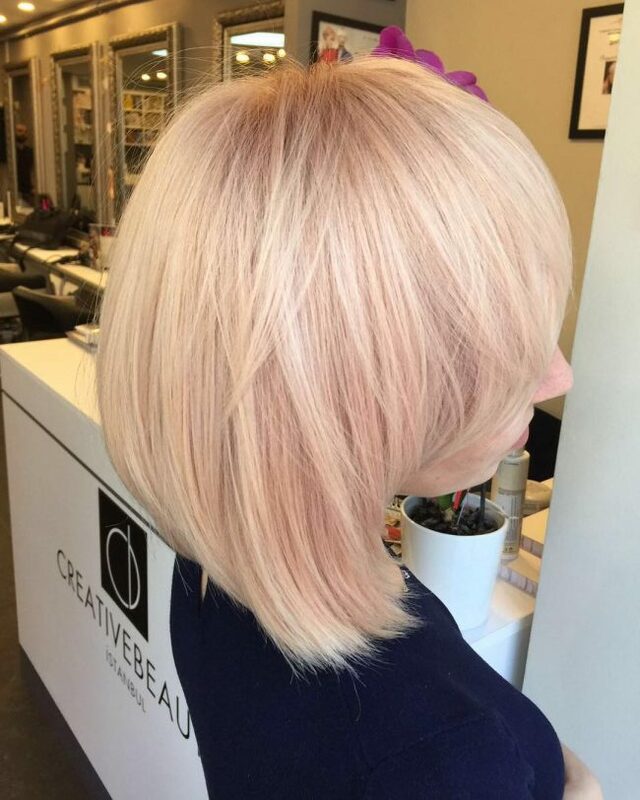 In this headdress, the shade combines with light blonde to create an elegant shade, and it also has a hint of pink that helps to spice up the short choppy bob. 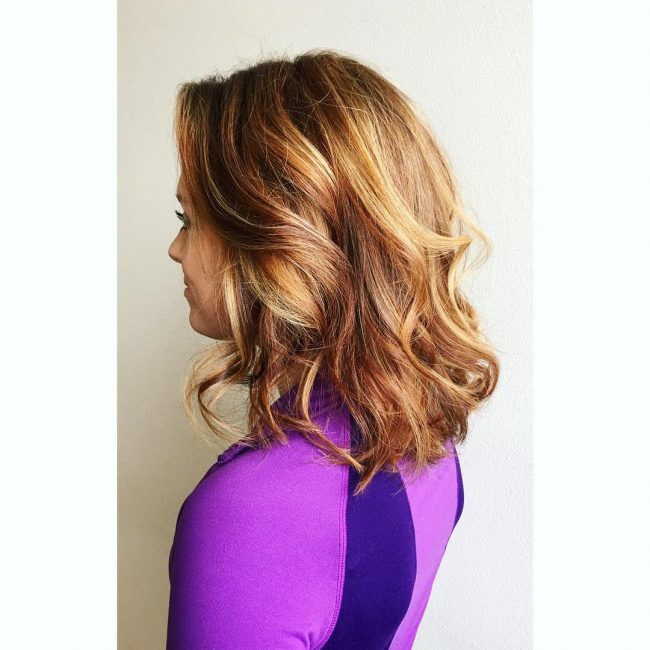 The color technique that you use on your hair is as important as choosing the right hue. This headdress proves this beyond any doubt because the hue is a simple strawberry blonde but the ombre color pattern makes it look very refined. A simple side braid can make a big difference to your hairdo as it adds some class to it. However, the color is still the most important element in any headdress, and this particular one is a blend of blonde and different shades of brown. The moderate waves and the length of the hair also add to the beauty of the style. 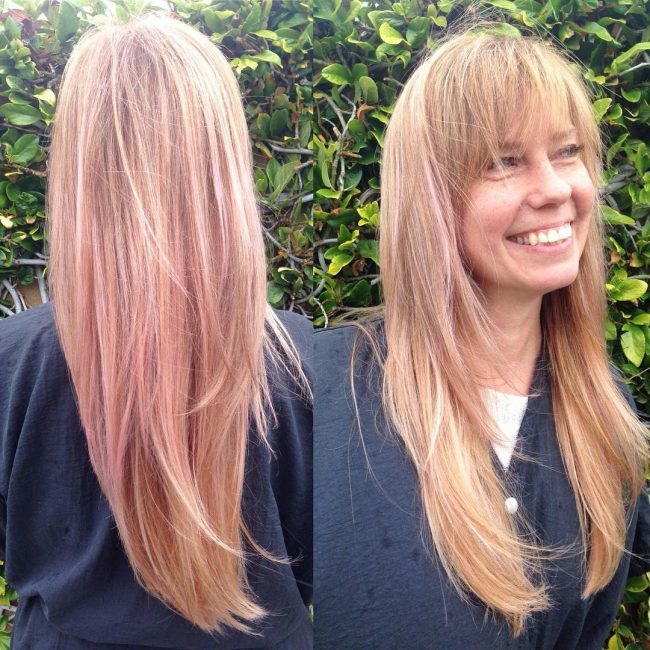 Pink strands are very feminine, but you do not have to go with a complete dye job for the entire head since a few highlights can also give you the same look. For this headdress, the pink hue is a hint in a dominant blonde shade, but the swirls on the hairs are what make it look refined. The transformation that comes from the sweet beige tone on this headdress is magnificent, and it makes the wearers long, and smooth strands look very classy. Apart from the color the hair also has a simple but elegant style that involves side parting and brushing the strands to accentuate the face. Wavy strands are very attractive, but if you want yours to look distinct, you should give them a vintage design like the ones in this style. Here the waves have an excellent volume, and they are designed with a slick back design to create a fabulous look. However, their dark color and dyeing technique are also very distinct. This mane is truly glimmering, and it will make a woman look very classy. 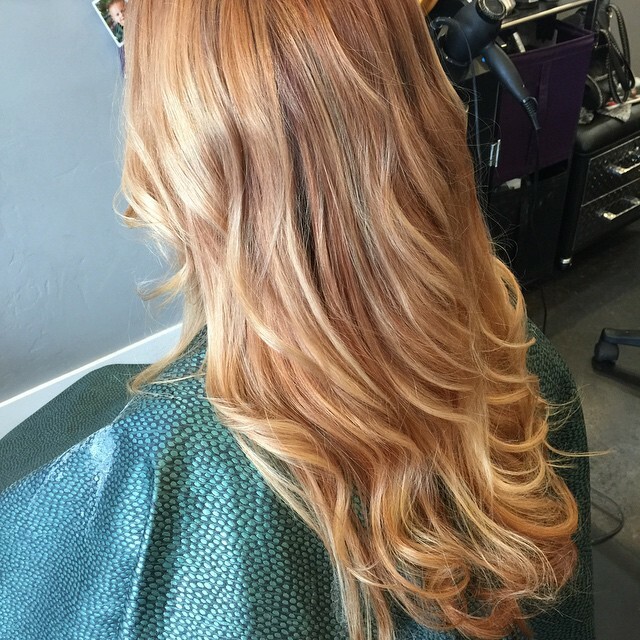 The reddish brown color blends in with the natural blonde shade to create an attractive tone. These locks also have some subtle swirls and an excellent volume that makes them look fantastic. The styling of the hair is also eye catching and very simple as you only need to create a side part and sweep the locks to the sides. 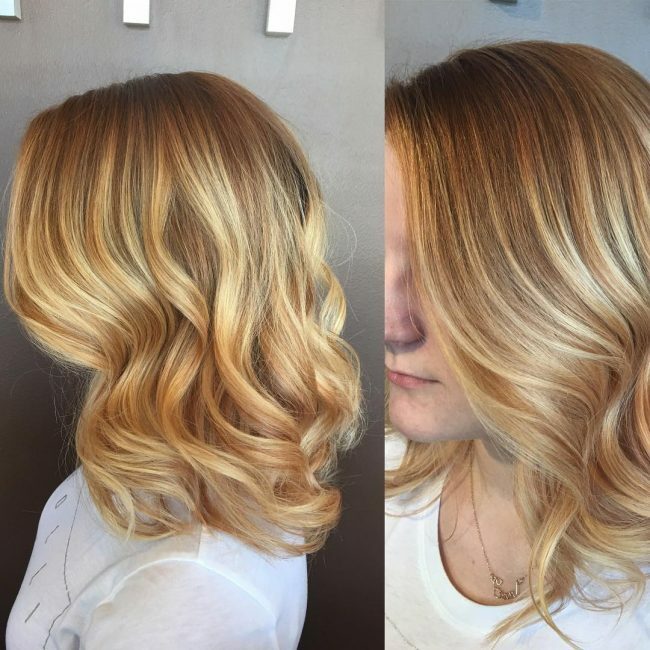 Balayage is an easy way to create an elegant hairdo without having to do much. In this style, the dyeing technique helps to give the long swirly locks a distinct tone. 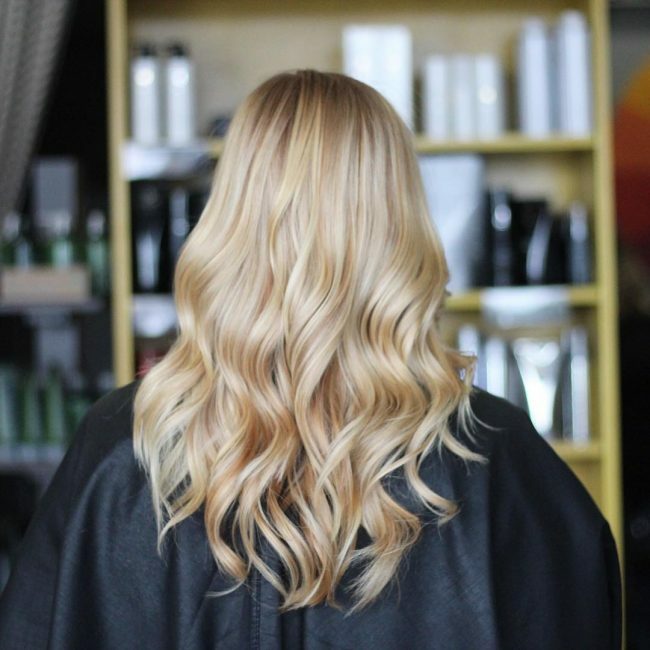 A golden blonde shade is blended with a strawberry hue on a black base to create a lovely color mix. The long tresses also have some beautiful curls that you should style by brushing the locks to the side to create a face frame. Even if you have fine hairs, you can still create a stylish look by chopping them inventively and using a beautiful shade on them. 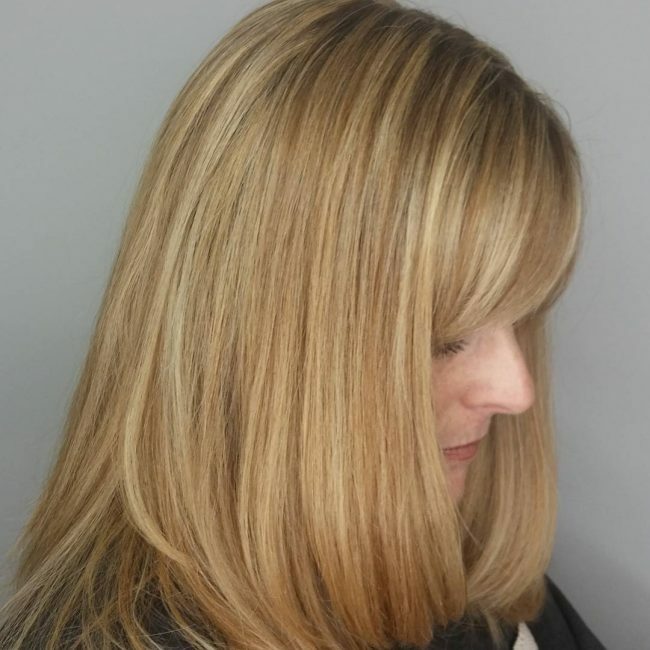 This style is an excellent example of how you can style your fine strands, and it has a short and neat fringe and smooth flowing strands with a light brown and strawberry blonde dye job. Although this hair is not as dark as you would expect it is bold enough for strawberry blonde hair. The size of the strands and its style are also very distinct, and they help to showcase the beautiful colors. Hand painting is what makes the dark brown shade look fantastic and its Sombre color pattern makes it look modern. Strawberry blonde hair is trendy, and it will make a modern woman look very classy. If you are looking for a distinctive shade that will make you stand out, then this is the perfect shade for you. 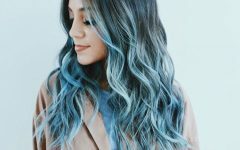 Even if you do not know how to style your hair or dye it, the above 60 hairdos will give you enough inspiration on what you can try. And just like with any other color, trying out a few is the best way to find something that will work for you and conform to your personal preferences.